Montevergine is located near Avellino, in the comune of Mercogliano, in Campania, central Italy. The mountain is a limestone massif and part of the Apennine chain. Under the peak, at some 1,270 m, is the Sanctuary of MontevergineNotes 1 – where the climb ends. Montevergine di Mercogliano climb profile. 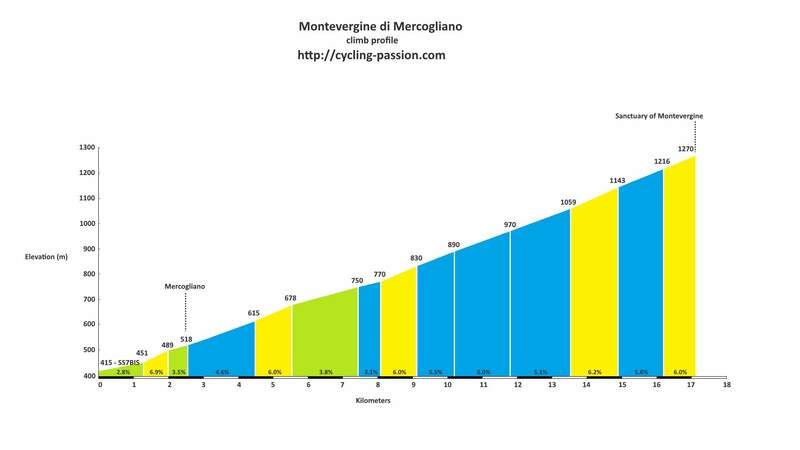 Starting from Mercogliano, the Montevergine ascent is 17.1 km long. Over this distance, you climb a total of 855 meters. The average percentage thus is 5%. 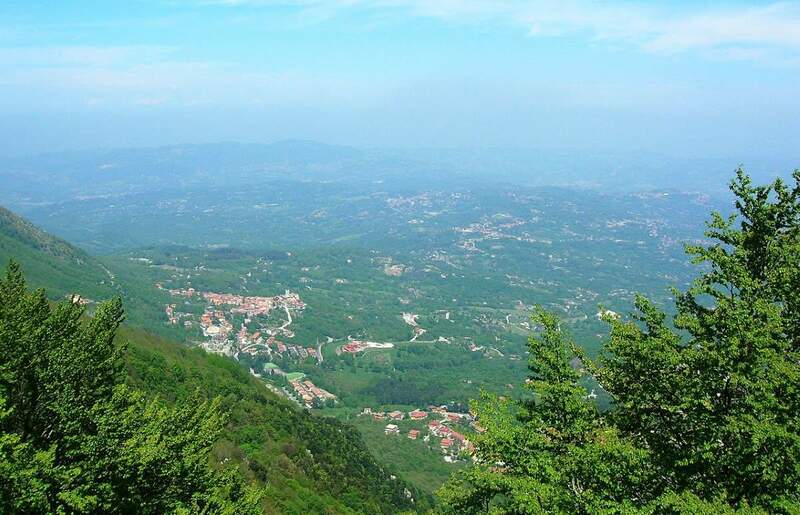 The Giro d’Italia visited Montevergine five times in history, in 1962, 2001, 2004, 2007 and 2011 editions. In 2018, the Italian Grand Tour will climb up to the sanctuary sixth times. The climb is included into the Stage 8 as the second summit finale of 2018 edition, a 208 km going from Praia a Mare to Montevergine di Mercogliano on Saturday, May 12. Friday, May 25. When the peloton got close to the stage seven ascent of Santuario di Montevergine (Sanctuary of Montevergine), the attacks began in earnest. Belgian Armand Desmet (Faema-Flandria), Henry Anglade (Hutchinson-D’Alessandro) and Giuseppe Sartore (Carpano) made their escape stick, beating the first chase group, led in by Nino Defilippis (Carpano), by 4 minutes 30 seconds. Desmet was the new maglia rosa with Anglade sitting in second place, 65 seconds behind. Franco Balmamion (Carpano) won the 1962 Giro d’Italia. Wednesday, May 23. The rain was coming down quite hard. With 15 kilometers to go, Panaria team’s Mexican rider Julio Alberto Perez attacked on the climb. His timing was well calculated since Dario Frigo (Fassa Bortolo) had to stop for a bike change after a fall, and Paolo Savoldelli (Saeco Macchine Per Caffe’) stopped for similar reasons. Perez was looking quite good with a 25-second lead, but with 5 kilometers to go, disaster occurred: his chain snapped and he was passed by Cantina Tollo team on the front of the peloton, who started to pile on the pressure with their team leader Danilo Di Luca feeling good. The finale was a battle between Di Luca, Stefano Garzelli (Mapei-Quick Step) and Gilberto Simoni (Lampre-Daikin). Garzelli found himself in front with 500 meters to go, and he couldn’t hold it as Di Luca came round him completely determined to win the stage, with Simoni picking up second in front of Garzelli and Giuliano Figueras (Ceramiche Panaria-Fiordo). Gilberto Simoni won the 2001 Giro d’Italia. Saturday, May 15. Gilberto Simoni (Saeco), the maglia rosa went with 1.5 km to go, but Stefano Garzelli (Vini Caldirola-Nobili Rubinetterie) was right on him. Under the last km, Eddy Mazzoleni (Saeco) hit the front with Simoni on his wheel and their Saeco teammate Damiano Cunego just behind. Simoni moved to the front with 500 meters to go and as the finish line loomed, the 22-year-old Cunego blasted off the front with an incredible sprint and took the stage win at the rapid speed of 39.336 km/h and with the 0’20 time bonus, the Maglia Rosa. Brad McGee (FDJeux.com) had a fantastic ride up to the Sanctuary of Montevergine di Mercogliano finish 2nd, while Franco Pellizotti (Alessio-Bianchi) took third place. Damiano Cunego, the “Little Prince” won the 2004 Giro d’Italia. Wednesday, May 16. At five kilometers to go, Julio Alberto Pérez Cuapio of Ceramica Panaria-Gaerne team had a 20-second lead over the leaders’ group. Panaria was playing the team game perfectly as Emanuele Sella was covering the moves on the front. The next two kilometers would be crucial for the Mexican who powered his 53×19 through the hairpin turns up to the Santuario. Although he tried to hang tough, World Champion Paolo Bettini (Quick Step) dropped off from the now 25-strong gruppo. With just two thousand meters left to race, Pérez Cuapio was gritting his teeth, hanging tough with a lead of 20″ and it looked like he might hold on. However, the Liquigas train was at full throttle. Maglia Bianca Vincenzo Nibali was flying in front of the now 10-man chase group and the Mexican’s magic just wasn’t enough to hold off the acid green wave of Liquigas. Next up for Liquigas was Franco Pellizotti. He rode a perfect uphill lead-out for Danilo Di Luca, simply shredding the competition. With 200 meters to go, “The Killer” showed how he earned his nickname with a brilliant uphill sprint for the stage win, just ahead of Ricardo Riccò of Saunier Duval and Damiano Cunego (Lampre-Caffita). Friday, May 13. A 5-man escape took off early in the stage and managed to stay away until the lower reaches of the final climb, the 5% gradient Montevergine di Mercogliano. There, Omega Pharma-Lotto rider Bart De Clercq jumped, hoping to make contact with the riders still up on the road. He blew by them while the peloton remained disinterested. Towards the top things heated up in the pack, and the neo-pro De Clercq barely hung on for the stage win. Maglia Rosa Pieter Weening (Rabobank) was with the front chase group and retained his lead. Alberto Contador (Saxo Bank Sungard) would win the 2011 Giro d’Italia. But, later, his results were annulled. Sanctuary of Montevergine was consecrated in 1124 near the ruins of a temple of Cybele. The new basilica, built in 1961 by the Italian architect, engineer and politician Florestano Di Fausto (16 July 1890 – 11 January 1965), is home to a 13th-century Byzantine icon of a black MadonnaNotes 2. The abbey palace was designed by the Italian painter, sculptor and architect Domenico Antonio Vaccaro (June 3, 1678 – June 13, 1745), and has an octagonal plan. The Sanctuary is the cathedral of the Territorial Abbey of Montevergine. The term Black Madonna or Black Virgin refers to statues or paintings of the Blessed Virgin Mary in which she, and often the infant Jesus, are depicted with black or dark skin. The Black Madonna can be generally found in Catholic and Orthodox countries.